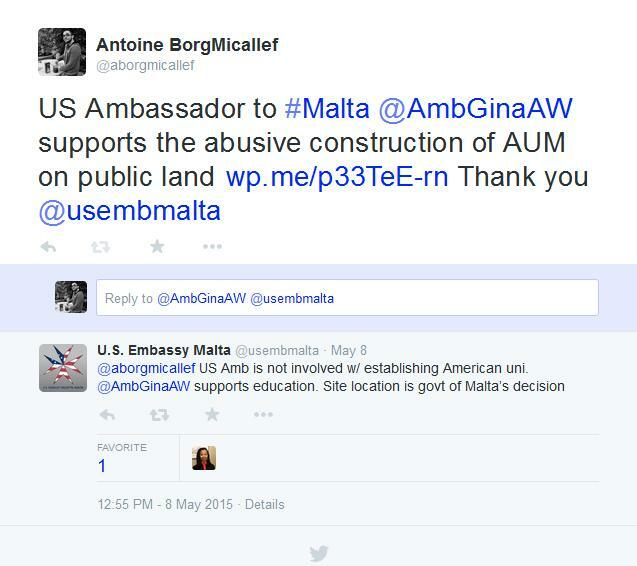 More revelations into the secretive agreement for the setting up of the (fake) American University of Malta keep surfacing. It has been reported that the government has (secretly, once again) reduced the requirements of educational institutions to get recognized as universities. The US Ambassador to Malta meets Malta’s Environment Minister following the formation of the new Government in March 2013. I wonder if they discussed sustainable development during the signing of the corruption-riddled secret agreement between the Maltese Government and the Jordanian Investor for the setting up of the (fake) American University of Malta on natural public land? “A legal notice published on 8 May modified the Further and Higher Education Licensing, Accreditation and Quality Assurance regulations, to allow any “accredited higher educational institute” to become a fully-fledged university if the National Commission for Further and Higher Education deems it to be “in the national interest”. The Prime Minister said that this was done in order to eradicate the Monopoly of universities in Malta. While I am one to have voiced concerns regarding the style of teaching at the University of Malta and the level of its academic staff, I have to admit that I really cannot complain at the level of education I have received…especially when it can allow me to attend any renowned university in the world. Furthermore, education in Malta is free, while the (fake) American University of Malta will be a private institution that will cater to rich spoilt children. Who are we kidding? The timing of this change would even arouse suspicion in the most corrupt country in the world, let alone an EU Member State. This is exactly why I do not understood why the US Ambassador to Malta would plaster her face across this project in the first place. While I have never met Gina Abercrombie-Winstanley, and I am sure she is a lovely person, I abhor dishonesty and deception. I feel particularly cheated by my Government, so knowing that this abusive and corrupt project is being openly supported by the Obama administration through the US Ambassador to Malta, is infuriating. The US Embassy had retweeted directly to my account that Gina Abercrombie-Winstanley supports education. We have now found out that the Government actually amended the law to allow this (fake) American University of Malta to be called a university through the lowering of standards in the name of “national interest”. The implications of this change are boundless – what if accredited universities across the EU and beyond start refusing Maltese applicants as they deem their qualifications as arising from a country with weak educational standards? But Gina ‘supports education’, so all is fine with the world right? Well not really, as now it seems that this (fake) American University of Malta will also be damaging the reputation of the University of Malta and consequently hampering past, current and future Maltese students in their educational propects. So if the US Ambassador truly supports education, she should really explain her position on this whole issue. If she wants to be present at the ‘grand unveiling’, then she cannot hide at the embassy in Ta Qali indefinitely. Apologies Gina, but you have effectively become the US Embarrassment to Malta. Thank you for supporting the Maltese Government’s attack on our environment, and now also on our educational system.